SnapMotion 4.2.7 – Easily extract images from video. SnapMotion is the most innovative and most used tool to extract images from videos. The application allows you to extract frames with precision and without loss of quality. A manual mode allowing you to extract images precisely at the selected time. A batch processing mode allowing you to extract thousands images concurrently. SnapMotion has been designed to support big video files such as 4K movies and to extract every frame of your media if needed. 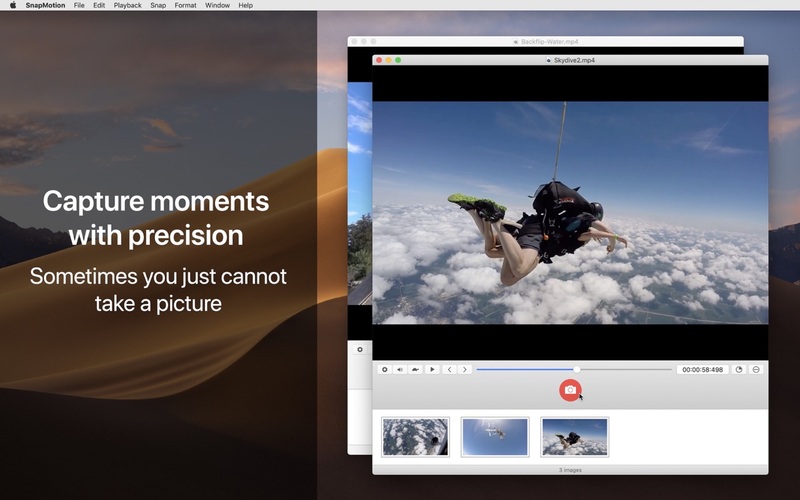 The application can play every video supported natively by macOS. Moreover it can export images into all industry-standard formats including PNG, JPEG, TIFF and HEIC. This version has been optimized for macOS High Sierra and later. Moreover the application is available in 7 languages (English, French, German, Spanish, Italian, Japanese and Chinese). Feedbacks can be sent directly from the application. In this way, you can contact us for any kind of suggestions and improvements in few clics. Next story Big Mean Folder Machine 2.38 – Bring structure to your file collections. Previous story Rocket Typist 2.0.1 – Expand typed abbreviations. FxFactory 4.1.6 – Visual effects for Final Cut Pro and other popular video editors. PlaybackPro 3.7.0 – Video playback workstation software. DivX Plus Pro 10.3 – Playback DivX media.